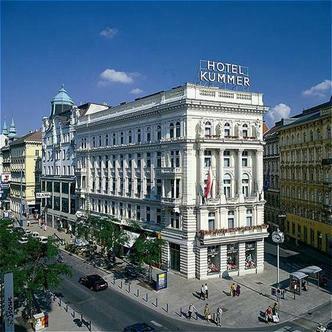 The central location of Hotel Kummer, in the heart of Vienna's most popular shopping street, the Mariahilfer Strasse and also close to numerous cultural points of interest, is ideal both for tourists and for business travelers. Centrally located on famous shopping street, near many cultural attractions like Ringstrasse, MuseumsQuartier, Art and Natural History Museum, Hofburg, Spanish Riding School, State Opera, Burgtheater, Raimundtheater, Theater an der Wien, flea market etc.. Benetton house is close by. Underground stop U3/Neubaugasse at 10 m, 1 km from Westbahnhof railway station, 20 km from airport.